You are here: Home / Language & Literature / Maltese literature sans frontiers? Parisienne by adoption and living in the French capital for over a decade, Elizabeth Grech is a Maltese national with a strong love of her mother tongue and the cultural baggage that goes with this unusual language unique to Malta. She is a project manager at the René Seydoux Foundation, a networking organisation among cultural actors and societies in the Mediterranean and administrator of Babelmed.net, a leading independent website and NGO on Mediterranean issues which is put together by a multicultural network of journalists across the region. Elizabeth retains a deep passion for her native country and its unique language. She has translated numerous works by Maltese authors into French, including those of poets Antoine Cassar and Adrian Grima as well as author Clare Azzopardi. Here, she talks of her love of the Maltese language and her hopes for Maltese literature through a new generation of writers. This interview first appeared in French on Babelmed.net written by Nathalie Galesne. How would you characterise the Maltese language? For me, the Maltese language is a real melting pot of history in the way it reflects the evolution of society on the islands and Maltese culture. It is the only language of Arabic origin which is written in the Latin alphabet. [Ed’s note: Dar, in the photo above, is the Arabic word for house as well]. It is influenced heavily by Italian and English as well as in part by French. It is also a very ‘young’ written language in a way as it only became an official language alongside English in 1934 when administrative use of Italian was dropped. But, it remains primarily in popular usage an oral language; « il-lingwa tal-kċina » (the language of hearth and home, if you like). When written, it has a syntax akin to Italian. It is a rich language; surprisingly so given the small number of speakers and its geographic spread. You’ll find however that both Malta and Gozo have their individual dialects, and even villages and towns within them have their own particular « djalett », or accent as well. What are the main difficulties you encounter in translating Maltese into French? I’ll talk about literary translation as that’s the style that I mainly deal with. Maltese and French have very different histories. One is young, the other far more ancient a language with a structure that is well documented over the centuries. In almost every facet of the languages – grammar, structure of phrases, script, conjugation, syntax – follow different paths. Maltese is far more flexible in syntax than French. Maltese doesn’t have set places for words according to their grammatical function. It will have far fewer points of reference. This means that translating Maltese is quite an arduous task but it also means you have to be passionate about the work, and explore all sorts of avenues in order to render up the same meaning and imagery. The art of translation – isn’t it always a rewriting, a transcribing, in some way? What makes the translating even harder is that there isn’t a complete Maltese-French or French-Maltese dictionary around. Sometimes when I find myself facing a problem of rendering a word in French, I use English as a way to navigate to the French meaning. Translating Maltese into French is an enriching experience, a way to rediscover, if you like, my mother tongue. I am continually coming across Maltese words that are new to me. Something that is particular interesting is that Maltese, like Arabic, is a language based on root words. Each word is in fact based on three, occasionally four, letters which comprise its root, and which confer its sense. With these three letters, one can weave on others to create a whole gamut of words, building up a broad vocabulary – an infinite reservoir of words. Certain Maltese verbs are onomatopoeic and it can be difficult to find their equivalent in French. Often, I find that a verse in poetry, when translated literally, is far longer in the French version. In these cases, I am obliged to revisit the original, to try to interpret and synthesise the idea while still respecting the original version. This is very difficult as there are the rhymes and the rhythm to respect as well. The two languages have a different music to the ear. So, the art of translating become here rather like the craft of the musician. I have to translate while ‘composing’ a music adapted to the other language, but still respecting the images, rhythm and the particular style of the original poetry. At times like these, it’s a real experiment. Sometimes, a poem translated sounds less good than in the original. At other times however, the translation can give the poem a new sense of strength that render it all the more impressive. What about the new generation of Maltese writers – are they making a clean break with Maltese literature of previous generations? New generations of Maltese writers are flourishing, making the most of the recent growth (out of proportion really to the island’s size) of various literary publications, particularly those dealing with poetry. 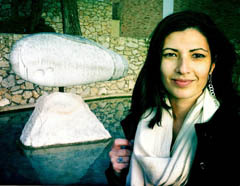 Maria Grech Ganado, a well-known and important Maltese writer, commented that there has never been such a strong literary scene on the islands since the 1960s. We’re seeing an increasing number of young Maltese making their mark early in their writing careers despite the difficulties they face in being published. I wouldn’t claim to be an expert on Maltese literature but after several years working as a translator, and having made close friends with a good many writers, I’d say that contemporary writers since the 90s don’t really feel a need to distinguish themselves by making a forcible break with past generations. They are far keener to renew the language, creating a new relationship with it and how it’s used, and to explore new worlds and themes through the medium of Maltese. That explains how they’ve managed to develop a different style and vision of the world from that defined by previous generations of Maltese writers. One can’t really talk about a conflict between generations, neither of a sense of continuity. One can see though that each author, each poet, has made a conscious decision to develop their use of the Maltese and to push literary boundaries, playing with the language, shaping the words even letters unique to Maltese to develop a voice of their own. The new generation dares to deconstruct and then construct phrases afresh. It is in a way a separation with the past in order to advance and progress but not really a complete break with the traditional usage of the language. Past generations of authors have prepared the ground for the newcomers to create their own paths while retaining the work of their predecessors as an anchor, a clear point of reference. According to Adrian Grima, new generations are more influenced and inspired by each other than by the writers of the 1960s. Maltese literature remains relatively unknown outside the country. In which countries is it most likely to appear in translation, and what do you feel are the key works an outsider should read in order to get to know a bit about it? Maltese literature is somewhat known in Italy, thanks to the work of writer Oliver Friggieri who, like some other authors, writes also in Italian. Maltese literature has been translated the most into English and Italian for obvious reasons of cultural ties and geographic proximity and by virtue of the fact that English is an official language of the country. It’s easy to find people to translate into English. Sometimes, authors translate their works into English of course. It is far rarer that Maltese works are translated into French. ‘Bateau Noir’ (the Black Boat), a collection of poems by Immanuel Mifsud, was translated into French by Nadia Mifsud and published in 2011. I am working on translating a collection by poet Adrian Grima. It is extremely rare to find any Maltese works translated into Arabic, despite that language having so many links with Maltese. The Inizjamed literary festival is attempting to fill that lacuna. A good many writers and poets from Arabic-speaking countries were invited to the last edition of the Inizjamed Festival. Participants took part in a week-long seminar on translation organised by Literature Across Frontiers. Inijzamed is a Maltese NGO working to promote Maltese literature and its translation; it had made significant strides in this area. For the past seven years, Inizjamed has organised the Malta Mediterranean Literature Festival in collaboration with Literature Across Frontiers, a network which is growing day by day, and which participates in numerous cultural and literary exchanges across the Mediterranean. A good many Maltese writers have had the opportunity to present their works abroad, but still, Maltese literature remains relatively unknown overseas. That might be in part explained by the fact that Malta lacks a real structure able to promote its own literature; it has a limited number of editorial houses, distributors, and limited critical appraisal mechanisms when it comes to its own literature. It is imperative that Maltese literature is translated into other languages. But, at the same time, in order for translations to grow, it is important to put in place structures to guarantee a better quality output; raise the bar as it were on Maltese literature. This new generation of Maltese writers is very open to world influences and to genre and thinking throughout the Mediterranean region and is building a strong network of support overseas and appreciation of what lies beyond Malta. We’re seeing a large number of today’s generation taking part in overseas literary competitions, with success, and presenting their works at various festivals. Let’s hope that we’re witnessing Maltese literature gaining a growing overseas readership and making the mark that it deserves outside its home country. A good resource for Maltese authors is in the Transcript review editorial here. Transcript is a bi-monthly review of books and writing from around Europe. Its aim is to promote quality literature written in the ‘smaller’ languages and to give wider circulation to material from small-language literary publications through the medium of English, French and German. Adrian Grima, Immanuel Mifsud, Maria Grech Ganado, Pierre J. Mejlak, Antoine Cassar, Oliver Friggieri, Clare Azzopardi, Claudia Gauci & Nadia Misdu. (More to follow soon as we’re compiling a list and of some publishing houses specialising in Maltese literature). Babelmed.net is the leading independent website on Mediterranean issues. It is free, totally independent and put together by a multicultural network of journalists from the whole Mediterranean. In Babelmed, you won’t find big declarations about clash or dialogue of civilisations. We believe that by reporting about contemporary and dynamic cultural productions in the region, we participate in breaking mental barriers and fight prejudices. Babelmed is a non profit organisation funded in Rome in 2001. It is since then supported by various donors from private to public foundations. Photos: Dar, courtesy of Sebastian de Gange. Photo of Elizabeth Grech courtesy of interviewee. Thanks to you all for you interest and support to Maltese literature. One book I would like you to translate into French is a historical novel which has proved very popular. It is called AĦWA BLA MA JAFU. I enjoyed reading this short study. I am a long-standing author of Maltese literature mainly for children. Please consult my website to have an idea of my works.